Little Dip Conservation Park, located just on the outskirts of Robe, South Australia, is the gateway to the famous Robe to Beachport run. 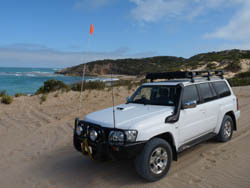 It also has many tracks and campsites within the conservation park, giving you the feeling you\'re in the bush but just one sand dune away from the ocean. Most tracks lead to the beach, but quite a few snake their way thru the middle of ther conservation park. Plenty of fauna, flora and excellent views. I put it down as 10km to 30km, but if you spend the day driving around exploring the other tracks, you will clock up close to 100km, maybe more!. Dry in summer but great for the beach, Wet and very windy during winter, excellent for offroading. I recommend it to everyone.